What did European and American women use for menstruation in the 19th century and before? The war changed German advertising and created shortages of products, as it did in America, Japan and elsewhere. The ad below is a bit more serious than an American Kotex ad from the war era (1943, Kotex), but both show patriotism. As it happens, both companies, Kotex and Camelia, sold the first widely successful disposable pads in their respective nations and probably led other companies in sales during this war. Curiously, both companies packed their pads in blue boxes (see a discussion of blue in the 1927 Gilbreth report to Johnson & Johnson) and both boxes often came plainly wrapped to their customers. Until about 1950 Germans found a slip of paper in the Camelia box that they could give the clerk; it read, "Please give me a discreetly wrapped box of Camelia." Modess pads, in the U.S.A., included a similar slip in their ads that women cut out and gave to the clerk. To save materials, the government asked women to save the Camelia boxes so they could be refilled. After the war, in 1946/47, women could get pads only by giving the clerk one kilogram - 2.2 pounds - of old paper, since manufacturers had stopped making pads. One woman recalled that she and her office mates in the American military government exchanged documents from their filing cabinets for pads at the drug store since old paper was hard to find. The shortage of pads in Japan after the war allowed unions to legally negotiate leave from work for women during menstruation, which some companies still permit. A Japanese woman studying at the University of Illinois sent this museum her paper about menstrual leave in Japan. The pictures, below, and much of the information, above, come from Zur Geschichte der Unterwäsche. 1700-1960. Eine Ausstellung des Historischen Museums Frankfurt 28. April bis 28. August 1988, by Almut Junker and Eva Stille; FfM, Germany (Historisches Museum) 1988, the catalog of an exhibit about the history of underclothing in the city historical museum of Frankfurt am Main, Germany, in 1988. Above: Ad from the magazine Mode und Wäsche, 1940/41, for Camelia menstrual pads. the German woman masters the most difficult duties. No one will ever notice that she's not completely at her best, because today's Camelia protection gives her more safety and and freshness and offers good protection. The Camelia output of pads covers her needs. Camelia, the ideal disposable [Reform] menstrual pad. 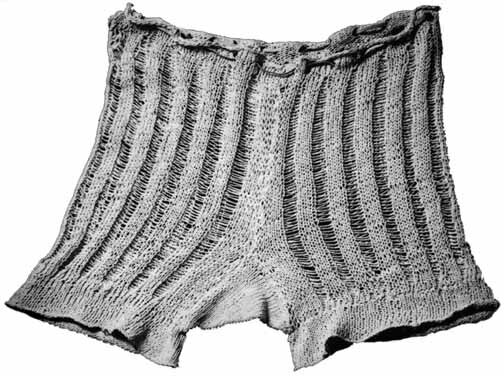 Above: White underpants hand knitted from the fiber of American sugar sacks, 1945/46 (in the City Museum of Munich, photo from Zur Geschichte der Unterwäsche. 1700-1960), showing the make-do attitude of post-war Germany, and the talent of a German woman.